Tonight I attempt to defend Vladimir Kramnik from those who cast stones at the former World Chess Champion. I believe the upcoming 2008 World Chess Championship will be an exciting event played between two outstanding chess players who are wonderful ambassadors for the game of chess. Below are my opinions about the three most common critical myths that haunt Kramnik. 1) Kramnik plays “boring” chess. 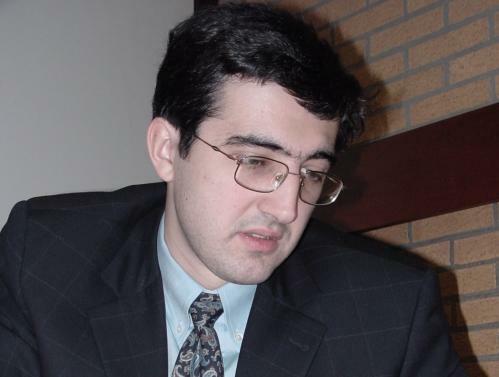 Kramnik has a very solid style that sometimes receives criticism for being boring. The fact that he can draw at will as black actually makes hims very exciting to admire in chess matches. If he gets ahead of Anand in the match, Anand will have to try radical ideas to make a come back. In this way, Kramnik’s solid play actually inspires exciting games. 2) Kramnik consults a computer in the bathroom. This is simply not true. From what I’ve seen there’s no conclusive evidence to support cheating by Kramnik, just circumstantial tid-bits that seem important out of context and are perpetuated by Topalov’s fans. 3) Kramnik refuses to recognise Anand as the World Chess Champion. Those critical of Kramnik enjoy taking his comments in the interview quoted below out of context. Perhaps to some deranged minds creating controversy where it does not exist adds excitement to the match. EURO: You reach arguable better results during matches then in tournaments. Traditionally, the World Champion title was to be won in matches. A challenger had to beat the reigning World Champion in the direct fight in order to become the new World Champion. The only historical exception was the situation just after the end of the Second World War, when Alexander Aljechin had died during his reign and so a tournament was played. KRAMNIK: You can call me an old- fashion guy, but I still believe that the real chess championship is actually a match between the best players, not a tournament. So that is going to be the match which will take place between me and Vishy Anand this autumn in Bonn. The tournament in Mexico which you are asking me about was from my point of view a huge compromise. The problem was that the situation around the World Champion title was still difficult even after my unification match against Top alov. There was a need to find an acceptable compromise. After the unification my aim was to come back to a final match contest for the world champion crown under the umbrella of FIDE. In all the years after defeating Kasparov I felt this responsibility. Anything else would not have been in accordance with chesshistory, and also not with the desire of the overwhelming majority of chess fans all over the world. It was always my goal to end the unhappy period when the World Chess Federation organised their ridiculous knock-out or round robin tournaments for the title. The problem was that the tournament in Mexico had already been agreed and I was informed that if I had refused to play there, the event would not have taken place at all. This would have ended in another impasse. So in order not to cause another split I, in the end, agreed to compromise and played the tournament, which FIDEcalled World Championship. The truth is I did not win in Mexico, the winner was Anand, and I will compete against him this year in the real contest for the chess crown. I attach ten times more attention to the coming match in Germany – consequently this event is ten times more important to me than the tournament in Mexico. EURO: So d o you consider Vishy Anand to be the World Champion or not? KRAMNIK: It is not a question of simply yes or no. Anand won the tournament, which was called the World Championship Tournament, and I competed in that tournament as well. The I nternational C hess F ederation FIDE agreed to do it this way, so I have no right not to consider him the World Champion. A question is, however: what is the value of such a title? Similary I considered Kasimdzhanov to be a FIDE Champion, after winning the knock-out tournament in Libya. However I did not consider him to be the real champion. He had won a tournament and by FIDE’s definition he was a FIDE World Champion . But the value of this title was lower compared to the classical title won in a one-to-one match by Champions like Lasker, Spasski , Kasparov or me. The winner of the match Kramnik -Anand won’t be World Champion only from a legal point of view , he will be considered to be the World Champion and best chess player by the entire public. The interview was published in the magazin “Weekly Euro”. This entry was posted on October 8, 2008 at 7:01 am and is filed under Anand vs. Kramnik, World Chess News. You can follow any responses to this entry through the RSS 2.0 feed. You can leave a response, or trackback from your own site. So basically you are saying that Drawnik is not a bore and his rising un-popularity does note really feed from the Toilet Gate computer and mole sized transitors.